“Line Drawn Balloon” is stamped with a Calypso Kaleidacolor stamp pad on yellow card stock to create the background which is edged with Fiskars’ Art Deco scissors. “Frame #16, Southwest, Bold, Lg.” is embossed in gold on off white card stock and glued to the yellow balloon background. 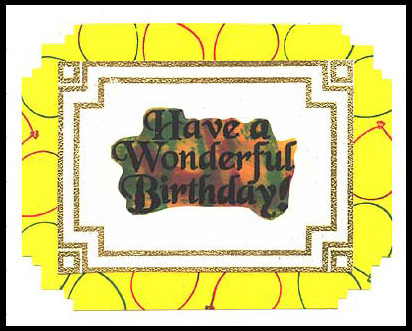 “Have a Wonderful Birthday!” is embossed in black on vellum and the back side of the vellum is colored by “direct to paper technique”. Card by Davetta Alexander.